During the first 3 weeks of October 2017, our research team used aerosol samplers to conduct surveillance for avian influenza at Ha Vi market, the largest live wholesale poultry market in Hanoi. We positioned the samplers 0.5 m from the ground and next to live bird cages and sampled for a duration of 4 hours for each sampling. 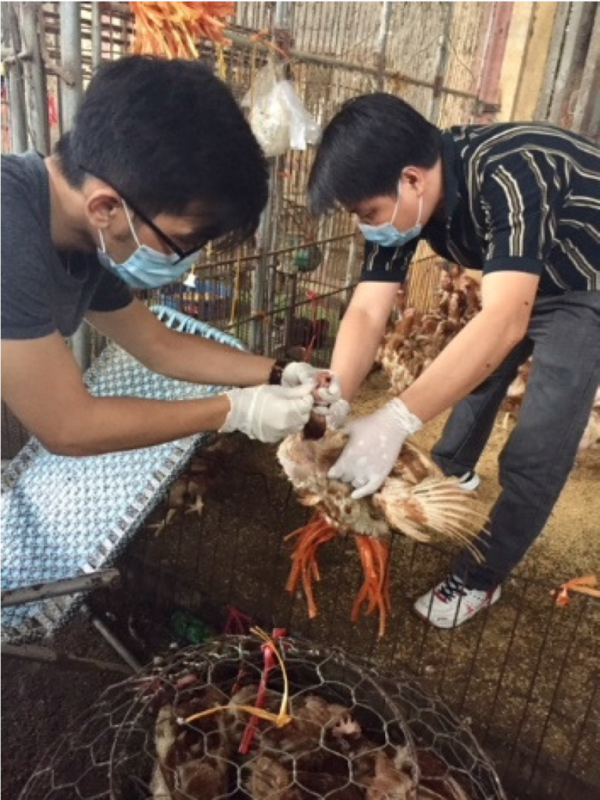 During that time, researchers also collected 15 to 20 oropharyngeal (OP) swab samples from chickens and ducks situated 0.2 to 1.5 m from the air samplers. Our study found that 90% of 30 aerosol samples and 47% of the 116 pools of poultry OP swabs were positive for influenza A. Egg culture yielded one influenza A virus from the aerosol samples that was not an H5 or H7 virus, and 25 influenza A viruses in the OP sample pools, including five H5 viruses. Strong associations between positive sample types in the aerosol samplers and the OP swab samples were observed, including 91.7% of positive OP pool samples confirmed by positive aerosol samples and 81% of influenza A aerosol samples confirmed by the positive OP swab samples. This pilot study supports the use of aerosol sampling in concert with other surveillance methods as a tool for screening large poultry markets for avian influenza virus. This study was an internationally collaborative effort between researchers from institutions in Vietnam (National Institute of Veterinary Research and International Livestock Research Institute), the USA (Duke University and North Carolina State University), China (Duke Kunshan University) and Singapore (Duke-NUS Medical School). The results were recently published in the journal Clinical Infectious Diseases.